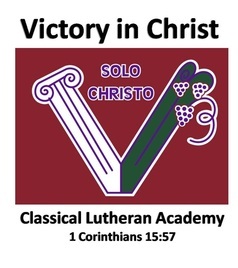 Victory in Christ Classical Lutheran Academy seeks to glorify God by helping parents provide their children with an excellent educational experience with the teachings of Christ at its very core. We encourage spiritual, intellectual, physical, emotional, and social development in children through nurturing and guiding relationships with teachers and families. As you explore our website, it is our prayer that the information included will help you make an informed decision about the education of your child. May the Lord bless you as you bring up your child in the Word. ​© 2018. All Rights Reserved.